A couple of years ago, I didn’t even know what a kumquat was when Shaina from Food for My Family nicknamed her oldest son “Kumquat” on her blog. But last week when I saw them next to the blueberries and blackberries at Walmart, I couldn’t resist buying a pack to try them for myself. 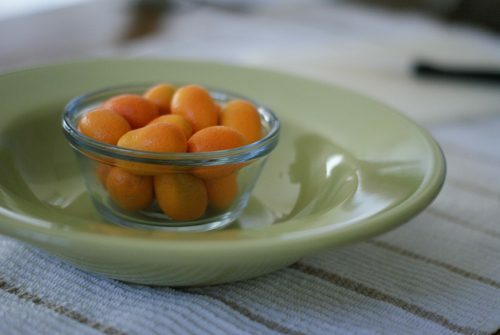 The kumquat is a tiny orange-like fruit that’s about the size of an olive. It’s bright orange skin is not only edible, but is actually the sweetest part of the fruit, balancing out the intense tartness of the flesh. 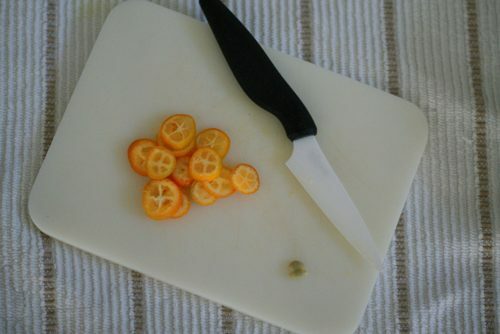 Kumquats can be eaten whole, sliced and added to salads and other dishes, candied in a sugar syrup or pureed. To eat a kumquat, first wash the skin well, removing the tiny stem as you do. Then, you can either pop the whole thing in your mouth, cut it in half to easily remove the seeds (otherwise you can swallow them or spit them out) or slice it in thin slices to add to salads or eat as a snack. My kids aren’t convinced yet, but I find the combination of sweet and tart pretty addicting, and I think I’ll be buying these more regularly now that I’ve given them a chance! Have you ever had a kumquat?